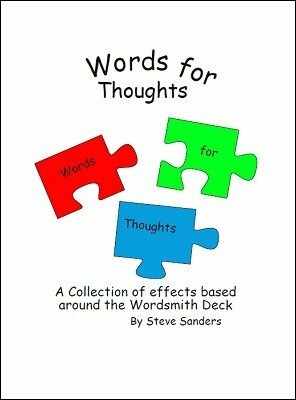 Seven great effects in one eBook, all based around James Ward's Wordsmith Deck - a pack of some fifty cards consisting of fifty different words. Three spectators put their chosen word into an envelope, the envelopes are mixed by a fourth spectator. The first three spectators are then asked to choose an envelope - they all choose the envelope containing their word. Random words are picked from a dictionary, a spectator, or number of spectators, pick a word each. Each of these words are then discovered and revealed by the magician. A volunteer freely cuts the deck and takes a word card, the magician by word associations reveals that word. Members of the audience take a number of words from the Wordsmith Deck. They choose one word each from their cards which are then shuffled thoroughly and returned to the magician who reveals the each of the words chosen. The word chosen by a member of the audience is divined and revealed by an unsuspecting volunteer. The magician reveals the word from a freely chosen position in the deck. Two words are chosen by two spectators, separated in the deck and then found again by the spectators. 1st edition 2014, 30 pages.